Facts, the English man said, are sacred. They are also stubborn things as they refuse to be obliterated. The international community had, many years ago, acknowledged the fact that Bishop Samuel Ajayi Crowther and his team of missionaries first set their feet on Onitsha soil in 1857. It is also an incontrovertible fact that the Roman Catholic missionaries arrived Onitsha twenty-five years later when the gospel had taken firm root in Igbo heartland. Thanks to the benevolence of the Anglican Church. Because the Anglican Church is best known for its universal brotherhood of man and the Biblical injunction of being their brother’s keeper, Bishop Ajayi Crowther and his White missionaries most benevolently gave a large chunk of land acquired by the Anglican Church to their Roman Catholic neighbours at a place which has now formed the nucleus of the Holy Trinity, Basilica, Onitsha. Today, a denominational battle is being waged unfortunately against the Anglican Church by the very people Bishop Crowther showed an unparalleled magnanimity in their times of need. It is hard to believe that such people can stealthily fire darts of ingratitude on the Anglicans with unimaginable proportions in human history without caring a hoot. If the Anglican Church could be so generous, how can someone, in his right senses, have doubts about the authenticity and ownership of Bishop Crowther Memorial Primary School, Onitsha, which was of Anglican origin? Many sponsored writers have gone dry while castingating the exalted office, personality, dignity and integrity of the Bishop on the Niger, Right Reverend Dr. Owen Nwokolo and his wife, for a mess of porridge, specifically to impress the temporal powers that be. When did we become disobedient to Episcopal authority and intransigent like the Biblical King Saul? Oh, who did this thing to us? On the frivolous claims by one Chinelo Amobi that her family and others in Ogidi Community had donated to parcel of land on which the Iyi Enu Hospital was built as reported in the back page of the Daily Sun of November 21st, 2018, , it is good to educate the Princess that it was the Oze Community in Nkwelle Ezunaka in Oyi local government Area of Anambra State that gave the land to the Anglican Church. It is, therefore, stupendous and naive that the likes of the lily-livered Chinelo Amobi, who is bereft of historical facts, can descend so low from her highly respected monarchical background to dabble into the inky profession to abuse her own Bishop, Right Reverend Dr. Owen Nwokolo and dissipate a tissue of lies on the pages of Newspapers simply because she is on an adventure how payroll of her masters at the Government House, Awka. It was also not surprising that the journalist turned pastor can use a public forum to condemn the Anglican priests who were demanding for the rights of the Diocese on the Niger in a predominantly democratic society. Unless Anambra State is embedded in totalitarianism and Marchiavelian tendency which the Princess made everybody to believe, then the protest for one’s fundamental Human Rights could be a anathema in Nigerian politics. However, for the umpteenth time, the Anambra State Government, its cronies, hirelings and emergency writers of the stomach infrastructure like the Ogidi sacrificial Princess should know that the Bishop Crowther Memorial Primary School, Nkissi Road, Onitsha, is owned by the Diocese on their Niger. It is a public shame and disgrace that the Anambra State Government has been led in darkness like a sheep to the slaughter to claim what does not belong to it. One day, the News of these eventual handover of the school to the Diocese on the Niger will be more humiliating to the opponents of the Anglican Church that most breaking News in Nigeria that have his viral. Since the Anglican Church built the Bishop Crowther Memorial Primary School in 1956, shouldn’t the government give it back to them particularly when it decided to release such schools to their rightful owners? This question may not matter much in this day and age because Government is hemmed at all corners by religious bigots, charlatans and hangers-on, who use their denominational tenure to unleash marginalization tendencies on the hapless Anglican people. Besides every other considerations and mathematical calculations, the name of the school alone should have rang bell even in the deaf ears of the doubting Thomas’s, who would have been impartial observers in the on going danse macabre rather than feign ignorance of the situation on the ground. If there are still respect, honour and dignity today for the late Anglican missionaries who toiled relentlessly that others might see the light and know the truth, Government would not have gone too far in the mess that has distorted history before the birth of all of us. Certainly, right thinking persons would have remembered the footprints of Bishop Ajayi Crowther, one of the foremost men of God in human history and do the needful instead of listening to rhetorics of unsound bootlickers and godfathers in suitanic dresses. Obviously, a time such as this is not ripe enough to disenfranchise one Christian denomination or the other from their rightful and legal property. No doubt, we should not forget so easily that it was people from different denominations who contributed immensely to the much publicized victory of Governor Obiano at the polls in Anambra State and should equally be given fair treatment. It is, therefore, unchristian, unethical, as well as politically naive and religiously immoral to maintain a consistent conspiratorial silence while Rome burns under Mark Anthony. We pride ourselves as good Christians who worship God in truth and in spirit but cannot maintain a simple truth. What is going on today in Anambra State can make the early Anglican missionaries to turn in their graves, since the land they rightly acquired is being forcefully taken away from them with ignominy, impunity, recklessness and flagrant abuse of power. How come those in power have turned deaf ears to all entreaties and appeals to steer away from Bishop Crowther Memorial Primary School, an Anglican Church property? Perhaps, a little explanation and digression can help the doubting Thomas’s to see the reality of the situation on the ground. Firstly, Bishop Crowther Memorial Primary School is owned by the Diocese on the Niger since 1926, with a fully registered document in 1927. Only the uneducated can fault documents and choose war instead of peace. Besides, the Church Missionary Society(CMS), duly ensured that the school became a Local Authority School specifically for the purpose of aid and grant whilst the ownership of the school and land remained the property of the Diocese on the Niger. Since 1956, Bishop Crowther Memorial Primary School, Nkissi Road, Onitsha, was founded as a Local Authority School upon the application of the Diocese on the Niger. A Certified True Copy of documents in that respect are available for all to see. How then can one distort history on the pages of newspapers simply because he or she was handsomely paid to play a script written and directed by unseen forces? . 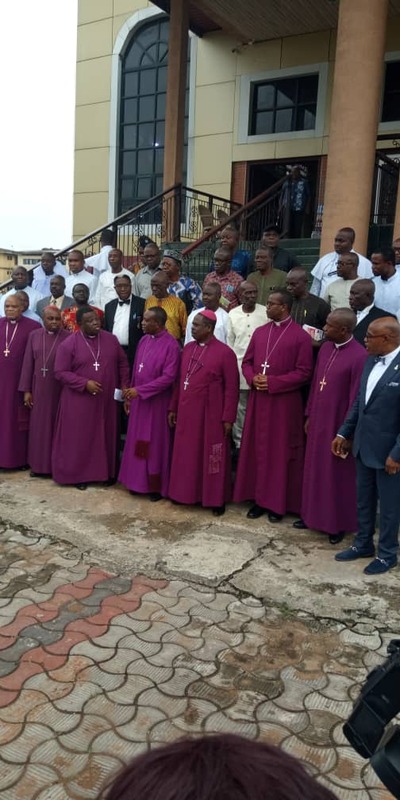 Notwithstanding the two proofs of ownership of the said school, the Justice G. U. Ononiba’s Committee Report recommended that Bishop Crowther Memorial Primary School, Onitsha, be handed over to the Diocese on the Niger. Government has the onerous responsibility to hand over the school to its rightful owners to manage, control and administer, rather than depend on its religious cronies to dictate the tune in the State. Of course, it is rather painful and ridiculous that a land, which has all the trappings of supporting documents of ownership should be so vehemently seized by the State Government. Despite all the name callings and hate speeches, it is fit and proper for the Anambra State Government to stop this madness before it precipitates to an uncontrollable gutter crisis since with proofs of ownership, it has no right to take what belongs to the Diocese. Written by Communication Bureau Diocese on the Niger.